The Access and Sustainability Advisory Service (ASAS) is a free service for voluntary and community groups in London. Funded by the City Bridge Trust, ASAS provides advice on making your premises more accessible to everyone, including disabled and older people. The short film, below, describes the service. From theatres to places of worship, museums, community centres, heritage buildings and sports facilities, the Access and Sustainability Advisory Service (ASAS) provides free guidance to charities looking to improve access to their buildings. For London-based charities, the service also supports applications to the City Bridge Trust’s Accessible and Sustainable Buildings grant which can provide up to £5,000 for access consultancy, including disability awareness training, and £100,000 funding towards access improvements. London charities can also apply for a free eco-audit of their buildings. The Access Advisor for ASAS offers free support throughout the entire grant application process, from where to go for a directory of access consultants, reviewing application forms to assisting the interpretation of access audits to enable prioritising costs and building works. For details on the City Bridge Trust’s ‘Connecting the Capital’ grant programme, visit the City Bridge Trust’s website (opens new window). 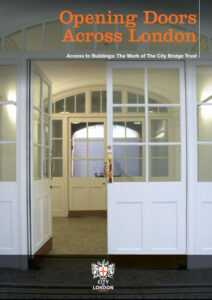 The City Bridge Trust commissioned Barry Knight at CENTRIS to produce a free publication, Opening Doors Across London (a PDF download), evaluating the impact of the Access to Buildings programme. Included are case studies of previous grant applicants to illustrate the issues faced by voluntary and community groups undertaking building projects. For further information on eligibility and the Bridging Divides grant scheme visit the City Bridge Trust website. The City Bridge Trust also provides fully-funded eco-audits to Greater London charity organisations in order to enable practical changes that minimise environmental damage, reduce costs, embed and share good environmental practice with the wider sector. Learn more about how to get a free Eco-audit (opens new window). London-based charities that own or lease sports facilities are encouraged to apply for City Bridge Trust’s Connecting the Capital grant. Organisations may also wish to contact Sport England to discuss their ideas for funding. One example is Inclusion London’s (opens new window) Into Sport project. Inclusion London is also supported by City Bridge Trust. 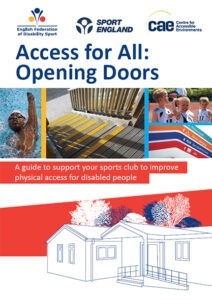 Access for All: Opening Doors (a PDF download), is a straightforward guide containing low-cost ‘quick wins’ for access to sports clubs. These management tips, however, can be carried out to achieve a more inclusive service in any building type. For a print copy, please visit the CAE shop.